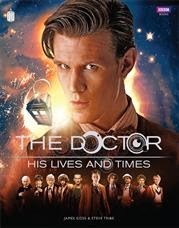 The Doctor: His Lives and Times, by James Goss and Steve Tribe, is out today; it's a mix of in-universe story and behind-the-scenes discussion about the show, from 1963 to now. The BBC Shop link is here, but this link provides a lot more options for buying it direct or from a selection of UK retailers, including Amazon. This is the third book the two have done together (after The Dalek Handbook and Doctor Who: A History of the Universe in 100 Objects). There's lots of contributions from other DW people, though: for one, Neil Gaiman wrote a prequel for "Nightmare in Silver", while Paul Cornell contributed some material from the "Journal of Impossible Things" (although that's been published in full elsewhere if you really want it). Cornell blogged about it, as you'd expect. Andrew Smith's enthusiastically recommending it, not least because he contributed "a couple of wee bits" about the Starliner. And Terrance Dicks penned a passage too! Blurb: "He's made a mark on almost every era of history, and he's touched millions of lives across space and time. In these pages you'll find just some of the stories behind those brief encounters, each of them addressing the question that must never, ever be answered: 'Doctor Who?'" "This is the story of an impossible life – of a man who borrowed a spaceship, travelled through time and continually saved the universe - as told by the Doctor's friends, by his enemies, and by the man himself. Letters, journals, trial records, secret government files and the occasional bit of tabloid journalism reveal the never-before-told story of Gallifrey's last Time Lord." There's an indescribable and amusing bit of fan ficcing about the book itself on the Doctor Who TV site (also written by James Goss), while a more mundane description can be found here. Sci-Fi Bulletin already has a very favourable review, as did blogger Scott Weller. Starburst's opinion was a bit more mixed. Tesco is doing a promotion giving away tickets to the "Doctor Who Experience" and more anniversary books; they had Goss wax eloquent about how wonderful DW is, so even if you don't want to enter have a look. Oh, and you can read Goss's blog here and his Twitter here.